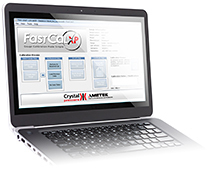 FastCalXP software allows you to complete a 10 point up and down calibration in less than 3 minutes including printing out a calibration certificate. FastCalXP frees you from manually recording and interpolating gauge readings, which helps reduce data errors. Download a fully functional 30-day trial version (2.1d) here! Not compatible with S2, S5, C2, or C5 gauges. Version 2.1d 04-Sep-13. Added support for Microsoft Excel 2013. Excel is also no longer require for the application to function. Added support for Windows 8. Russian language was added to the main install rather than a separate installer. Version 2.1c 01-Feb-13. Added nVision absolute pressure support. Increased the amount of data points allowed to 100. Version 2.1b 14-Nov-11. Fixed an error where the nVision MA20 Module was not recognized after moving directly from CrystalControl to FastCalXP without rebooting the chassis. Version 2.1 12-Jul-10. Added support for using the nVision as the reference. Removed some of the dialog boxes for a more streamlined calibration process. Moved the install of new templates to a common user folder. Version 2.0 07-Aug-08. Added transmitter calibration functionality by capturing mA and HART output from a pressure transmitter. Version 1.4c 28-Feb-08. Fixed an error where the 30 day trial ended early. Version 1.4b 28-Jan-08. Fixed an installer bug when initially installing in Korean or German. Version 1.4 27-Nov-07. Change the activation to a USB dongle rather than the online activation. Version 1.3 31-Jul-07. Added German, French, Japanese, and Korean language support. Fixed a grid sizing issue. Now supports COM ports above 9. Version 1.2c 07-Nov-06. Fixed a bug in the calibration complete dialog where the %error on failures were not correct. Fixed a bug in the data graph where the 2nd to last data point was not displayed. Unlocked the chart in the template so they could be modified. Fixed a download certificate bug. Version 1.2b 06-Oct-06. Added Chinese language support. Version 1.2 15-Jun-06. Added a feature to tie a particular template to a model. This allows easy switching from gauge to gauge. Fixed an error that prevented operation with the 30 Series as a reference. Version 1.1 20-Oct-05. Fixed a resolution bug for ranges where the minimum unit of measure was 1. Added new buttons for Loading Existing Assets and Creating New Assets to quickly start a new calibration run. Added a warning message when attempting to calibration with a reference that is out of calibration. Fixed an internationalization bug where decimal points (rather than commas) caused an error. Version 1.0d 31-Aug-05. Fixed bug with missing points in the graph. Version 1.0c 22-Aug-05. Fixed certificate template name error where an “x” was added to the end. Added auto serial port detection support. Version 1.0b 11-Aug-05. Added a new certificate template that supports up to 21 points. Warning implemented if the data tags from a template have been removed. Added a look-up function where previous certificates for a particular serial number are loaded.